Lamy Safari – F – A Hanukkah present from my in-laws. Love. Love. Love. Smooth as silk and I won’t need to be institutionalized if I loose it. I use it for everything. Pigma Micron – 08 – Began my love affair with these when my wife and I were looking for archival pens/inks with which to sign our Ketubah (Jewish wedding agreement: http://en.wikipedia.org/wiki/Ketubah). Well suited for brainstorming on legal pads. White Label Retro 51 or Knock off? – While I have a visceral aversion to all things ballpoint, this pen just feels darn good in my hand. Planning on getting some R51 refills to see if I can swap it in to my regular rotation. I got it from a Nikon Rep when I ran the digital photography department at Adorama’s rental shop. Uni-ball Signo DX – .38 – Gift from my brother. These were the love I left for the majesty of the fountain pen. I still roll it around every once in a while, for old times sake. Lanbitou 8012 – F – Peter, my friend and blogmate, lent me one of his and it was love at first write. It may be a cheap Chinese pen with very little hope of living a long life, but it writes like a dream and it’s mine, all mine. Pilot Vanishing Point – EF – Peter and his wife, Cat gave this to me as a wedding gift. If I lost it I might have to be institutionalized. My first fountain pen. It doesn’t see a lot of action but I’m hoping my neurotic fear of damaging and or loosing it will soon wane enough for me to put it through its paces. Baoer 519 – M – Very pretty and incredibly frustrating. I don’t know if I got a defective nib but this thing skips like that’s its job. All in all, it was six bucks. So I’d complain but who’d listen? Kaweco Classic Sport – EF – My wife consulted with Peter and gave this to me for Christmas. I was surprised by how much smaller it is than I expected it to be. But still, it’s a great pocket carry. And that Kaweco Sepia Brown ink is the bees knees. Jared, thanks for the submission! 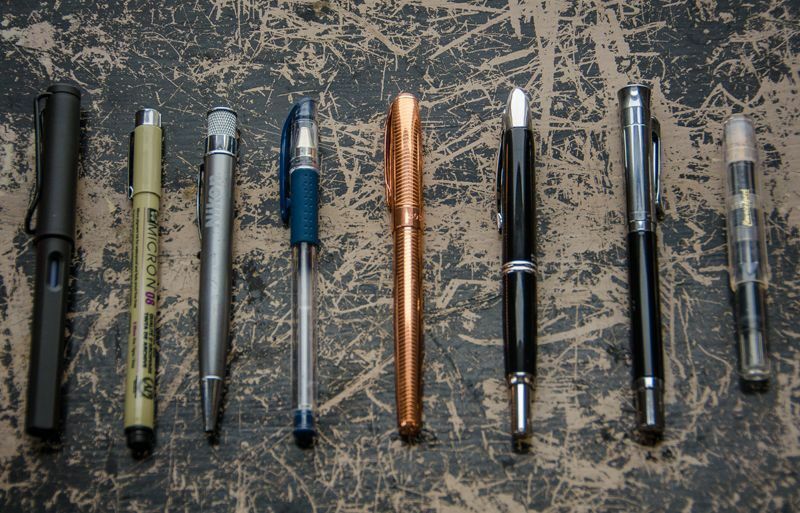 I really appreciate all of your descriptions and stories behind each pen. It definitely adds a level of personality and meaning to your collection and it’s awesome for everyone to be able to see. You have a pen for everything here, which is very important. All fountain pens are great, but if you need something archival, or have to sign a receipt, they may not always be up to the challenge. On top of that, it’s a really cool picture! You can find Jared blogging over at PenEnvy.net – make sure to check them out!